Four sunflower heads floated in shallow plates of water on the dining table. Earlier that day they had lined the path at a wedding. Now they graced my home. There they were in all their sunflower glory. Being themselves. Filling the room with cheery warmth. Inviting me to notice their rich golden yellow petals. To marvel at the how their seeds spiral clockwise and counterclockwise. Inviting me to smile. Inviting me to remember the mammoth sunflowers I planted at the far edge of the vegetable garden when I had a yard with enough sun for a vegetable garden. Some afternoons, I’d pull into the driveway and see a squirrel frozen on the face of a flower, hoping I wouldn’t notice she’d been eating the seeds. Inviting me to remember the night I walked with friends in silence through a sunflower labyrinth under a blue moon. Inviting me to play with yellow and orange threads and wonder when yellow becomes orange. 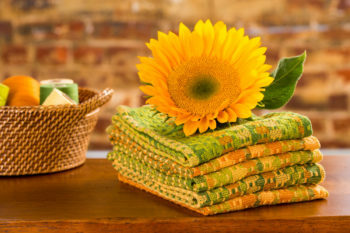 Inviting me to experience and weave warmth and happiness – the essence of sunflowers – into kitchen towels that invite you to smile and bask in their glow and savor your own beauty as you go about the ordinary business of life. 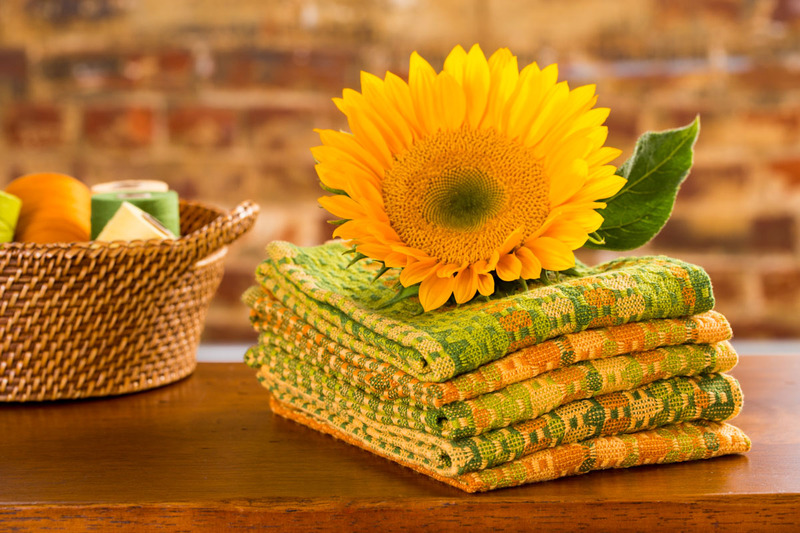 I just finished up some rag runner/mats and am debating starting some napkins or doing some more runner/mats with hand dyed fabric…. But I am also being pulled back into quilting some tops (I have a big stack of tops to be quilted) and then there’s rug hooking… (sigh) problem with enjoying too many fiber arts! What length of warp do you usually use? 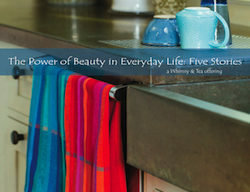 And I can’t remember – are you a Jack weaver or use a counterbalance ? Mmm, Deb — a lemon-lime margarita! My warps are usually about 11.75 yards and I use Jack looms.